Keala Settle, Jessie Mueller and Kimiko Glenn know it takes sugar, butter and flour to bake a great pie. Christopher Fitzgerald falls ... er, make that leaps for Glenn's waitress, Dawn. It’s easy as pie to fall for “Waitress,” a sweet comic musical returning Tony Award winner Jessie Mueller (“Beautiful”) to Broadway. Pop singer Sara Bareilles works a recurring chorus of those three ingredients, above, into many of the softly textured songs here, holding out the promise of scrumptious things to come. And deliciousness is on the menu. As a “pie consultant” recently told Playbill, nearly three-dozen ultra-desirable desserts are baked per week for “Waitress.” Most are displayed on twisting cases flanking both edges of the stage. A few are incorporated into Lorin Latarro’s yearning choreography. The Brooks Atkinson smells like pie. The theater even sells pie. Pro tip: try the Key Lime. In keeping with conventions of the late Adrienne Shelly’s 2007 film, the pies have unique names aligned with the story. So when Jenna, Mueller’s wistful waitress, learns she has unintentionally become pregnant by abusive husband Earl (Nick Cordero), Joe’s Pie Diner is soon dishing out “Betrayed By My Eggs” pie. Jenna has been steeling herself to run away from her spouse, stashing cash around their home. Her plan is to use the dough to win a local pie-baking contest and start a new life. Fate intervenes with the arrival of new gynecologist (Drew Gehling, charming and, like most princes, unavailable—his wife’s in town, doing her residency). I’m tickled that Settle, of “Lez Miz” and “Hands on a Hardbody,” is landing such plum roles these days. She impresses with her second act solo, “I Didn’t Plan It,” a rousing piece about adaptability to circumstances and learning to feel alive. The talented Cordero, a Tony nominee for “Bullets Over Broadway,” hits his character’s one nasty note, and hits it hard. Earl is a jerk, motivated by insecurities, and we worry what he might do to Jenna and their child. Christopher Fitzgerald (last summer’s “An Act of God”) steals scenes as Ogie, the high-strung tax auditor who woos butterfly-to-be Dawn with magic tricks, history and off-the-cuff poetry. The same can be said for Broadway vet Matthews, the vinegary diner owner who encourages Jenna to hang on to her dreams. “Waitress” does a swell job illustrating the shades of gray in human relationships. There are people here holding out for pie in the sky: Gehling’s Dr. Pomatter wants Jenna, but there is the matter of his wife. Becky and Cal are each doing things we could consider morally ambiguous, but their deeds somehow feel forgivable. Jessie Nelson’s book is sharp: “The fuller the condiments, the fuller the experience,” Dawn reminds her boss, in one of her sassier moments. 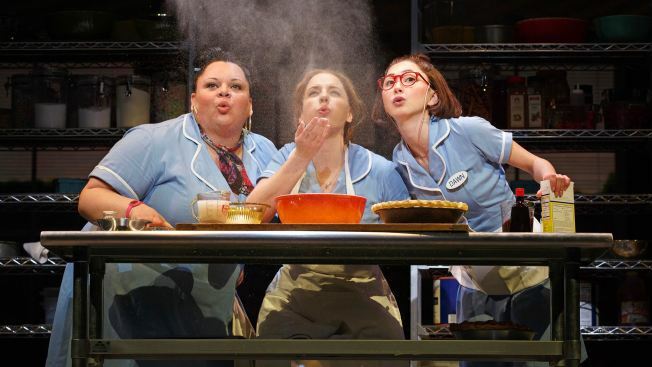 “Waitress” is more than capably directed by Diane Paulus, who started the production cooking last year at the American Repertory Theater, outside Boston. The pie is ready. Leave room for second helpings. “Waitress,” at the Brooks Atkinson Theatre, 256 W. 47th St. Tickets, on sale through Jan. 1, 2017: $55 and up, with premium seating available. Call Ticketmaster, 877-250-2929.